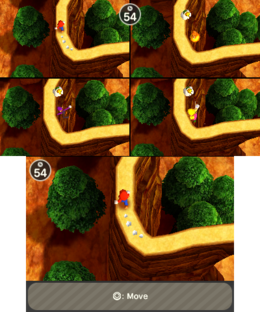 Paths of Peril is a battle minigame in Mario Party 4, and returns in Mario Party: The Top 100. 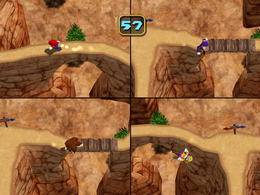 The minigame involves characters walking along narrow paths over a large canyon. The player has to move quickly but carefully, so as not to fall into the canyon. The first character to reach the end point wins. At two points in the course, players have a choice of going left or right at a junction. One path leads to a short, winding road, while the other leads to a maze of 90-degree turns. Both paths lead to the same place, but the paths that the players pick can be the deciding factor in their placement. Rules – "Walk the narrow path without falling to reach the goal!" Advice – "If you run carelessly, you will surely fall. Be careful, and keep your cool." Description – "Be careful not to fall off the winding path on your way to the goal!" On-screen – "Stay on the course and head for the goal!" Kunekune denjarasu Dangerous Twists, 「くねくね」 kunekune being onomatopoeic for something wiggly or twisty. This page was last edited on August 4, 2018, at 07:11.